When buying a desk lamp for any room in your home, there are a few things that need to be considered aside from just its appearance. To make sure that you make the right decision and give the right amount of lighting to your room, make sure to take note of the following tips so that your next lamp purchase can give you the warm, cozy illumination in your room while at the same time allowing the necessary space for other items that should also be present on the same table where you will be placing your new lamp. When looking for a desk lamp to add to your living room, consider its appearance as well. Lamps in a living room should not only function to provide task lighting, but also look beautiful and add aesthetic value to the overall interior décor of this space whether it is on or off. Just make sure that your lamps allow you and your guests to talk to each other without getting in the way. Height: An ideal height for a living room desk lamp is 26 to 34 inches. Another way to determine if the height of your lamp is just right is by sitting on the sofa or chair next to the lamp. The bottom of the lamp shade should be the same level as your eyes, not higher. Base: Choose a lamp that has a stable base. If you want to purchase a table lamp with a skinny, candlestick-style base, make sure that is substantially weighted so that it doesn’t easily get knocked off when someone bumps it accidently. Positioning: There should be a light source every 10 feet or so. For lamps positioned between sofas and chairs, it is best to have slim or transparent base so that conversations and sight lines flow freely. Shade: A lamp’s shade should never be wider than the table where it sits. A fabric or semiopaque paper shade provides a warm glow, while an opaque shade of any material can minimize glare especially when your lamp is placed near your television. If your interior design is modern, go for drum shades. For traditional homes, choose the conical ones. Bulb: If you are going to use your lamp for reading, get a bulb that is at least 60 watts. Use a three-way bulb or a dimmer to control its brightness. Style: Look around your living room and take note of the overall décor. Consider this when choosing your desk lamp and make sure to purchase one that complements the design of this space so that it blends seamlessly with the rest of your lighting fixtures and furniture. Give your dining room a refined look by adding a lam or two on the sideboard. 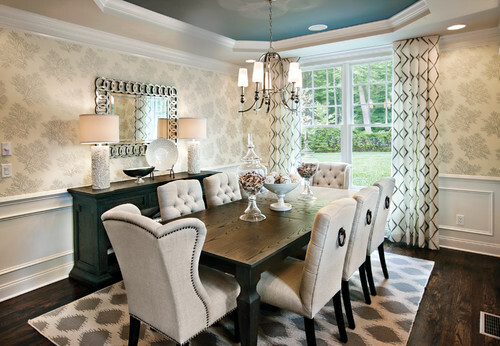 In dining rooms, table lamps serve to fill out the light from the chandelier or other light sources. Height: The lamp may be 20 to 36 inches tall, as long as it is not too tall that its shines directly to the diner’s eyes. Base: It is ideal to incorporate a slim-based lamp as this takes up less room, so you have more space for platters of food, tableware, or flowers. Positioning: Table lamps are best placed at the ends of the sideboard, especially when hosting a dinner, so that food, plates, and other items are placed at the center with adequate lighting. Shade: Since sideboards are usually slim, choose a lamp that would fit. Get one with a narrow lamp shade. If you want to cast a romantic glow within the dining room, opt for an opaque shade that has a metallic nickel or gold interior. Bulb: Best to get bulbs with less than 60 watts. Plug-in dimmers will be helpful, too. Using a silver-tipped bulb will help cut glare. Style: While getting a pair of desk lamps of the same design is alright, as long as they match the rest of your dining room décor, you may also be a bit bolder and go for two different desk lamps as long as they have some visual elements in common like material or color. Take time to pick the perfect lamp for your bedroom. It should be fit to be part of your personal sanctuary. Get the right angle and height so there is just enough light when you curl up in bed to read your favorite book. 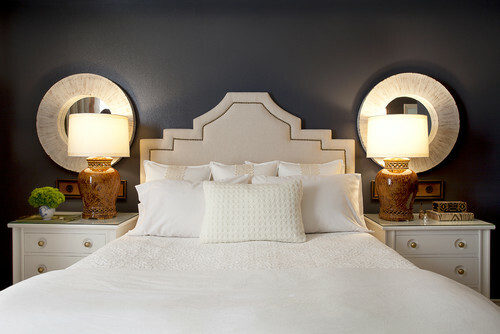 Height: The right height for a bedside table lamp depends on the height of your night table. Generally, a bedside lamp should not be higher than 30 inches when it’s placed next to a tall bed so that the light falls on the page, and not in your eyes. Base: The lamp base it should be wide enough to be stable while at the same time not too wide that it occupies the entire table. There should be room left on the table for your alarm clock, book, and maybe a pair of reading glasses. Positioning: Your lamp must be placed close to the wall so that you can place other essential items on the table and easily reach for these. Shade: Choose a small shade so you don’t accidentally hit it when you’re reaching for the alarm clock. Fabric and paper shades are best for a cozy bedroom ambience, whereas metal shades can appear to be cold in a bedroom. Bulb: Get a two-bulb cluster as this will let you use different wattages – a bright one for reading and a dim one for relaxing. Style: Consider the size of your bed. You can match a large, tall bed with a pretty big lamp, but if you have a low bed, get a smaller lamp. You may also want to purchase a lamp that has a switch on its cord so you don’t have to stretch when you need to turn it off.